The enzymes responsible for producing mono-rhamnolipids (biosurfactants) are called RhlA and RhlB which are encoded by the genes rhlA and rhlB respectively. The protein encoded by these two genes make up the subunits of rhamnosyltransferase I. The rhlA gene (Ba_K1688002) coding for the enzyme RhlA creates a 3-(hydroxyalkanoyloxy) alkanoic acid (HAA) fatty acid tail and the rhlB(BBa_K1688003) coding for the enzyme RhlB connects this tail to a rhamnose molecule making a mono-rhamnolipid. The biobrick BBa_K1688000 is a composite part of a promotor BBa_J23101 and BBa_K1688001 which transcribes the genes RhlA and RhlB into mRNA which eventually leads to translation of proteins that induce mono-rhamnolipid production. Both the drop collapse test and the CTAB test are nonspecific and only show indication that there are biosurfactants and rhamnolipids respectively present. To confirm the presence of mono-rhamnolipids, a thin layer chromatography (TLC) was conducted of the sample and with standard mono-rhamnolipids as reference. Mono-rhamnolipids were extracted from bacterial supernatant by solvent-extraction method using ethyl acetate and run on TLC silica plates using orcinol-sulphuric acid as a staining solution (Laabei et al. 2014). The extracted lipids were also sent for mass spectrometry analysis for further confirmation. Table 1: Biobricks used for gel electrophoresis, their inserts, restrictions enzymes used for digestion, lengths of inserts and plasmid backbones and expected band lengths. Figure 3: Gel electrophoresis. Well 1: cut BBa_K1688000, well 3: cut BBa_K1688002 and well 4: cut BBa_K1688003. All biobricks cut with EcoRI and PstI. Well 2: DNA size marker commercial 1kb. 1% w/v agarose gel stained with SyberSafe. Figure 4: Gel electrophoresis. Well 11: cut BBa_K1688001 with XbaI and PstI. Well 8: DNA size marker 1kb. 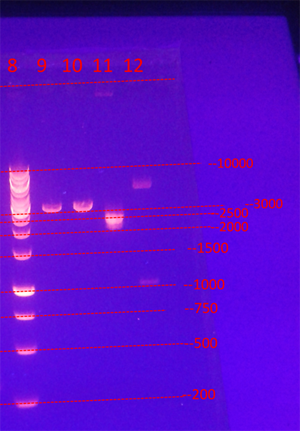 1% w/v agarose gel stained with GelRed. Figures 3 and 4 shows bands for each construct approximately as expected according to table 1. All biobrick constructs were verified by Sanger sequencing. 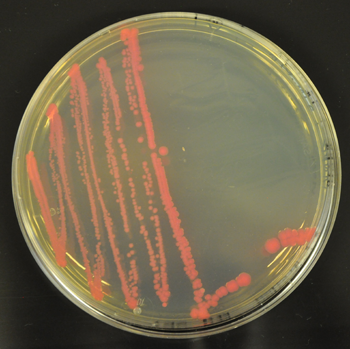 Figure 5: E.coli DH5α transformed with assembled product BBa_K1688000 + BBa_1688004 (dTomato construct) on agar plate. Red fluorescent color expression of cells from figure 5 indicates that the mono-rhamnolipid gene construct is working, in effect the genes rhlA and rhlB are transcribed. 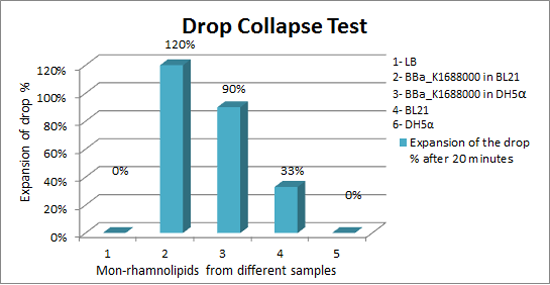 Table 2: Data from drop collapse test for different concentrations of standard mono-rhamnolipids. Diameter of drop after 0, 5, 10, 15 and 20 min, expansion of drop diameter in percentage and if the drop collapsed. Table 3: Drop collapse test for different samples; negative controls LB medium, BL21DE3 and DH5α, BBa_K1688000 in BL21DE3 and DH5α. Diameter of drop after 0,5,10,15 and 20 min, expansion of drop diameter in percentage and if the drop collapsed. Table 2 and figure 6 displays data of drop expansion test with standard mono-rhamnolipids (0, 0.2, 0.4, 0.6, 1 and 1.6 mg/ml). Table 3 and figure 7 displays the data of drop expansion test of LB medium, supernatant extracted from E.coli BL21DE3 with BBa_K1688000 respectively untransformed and supernatant extracted from E.coli DH5α with BBa_K1688000 respectively untransformed. 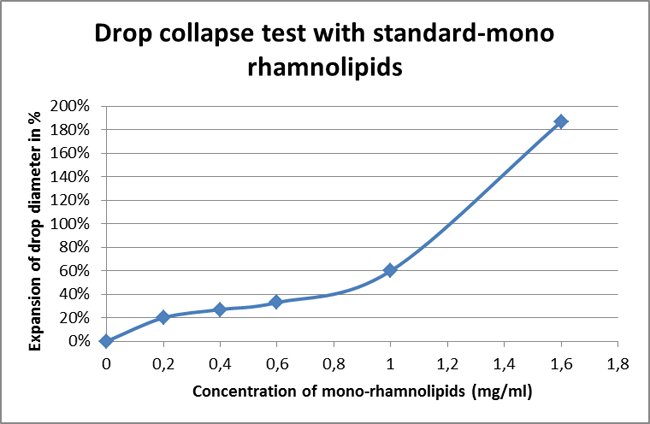 Table 2 shows that a higher concentration of mono-rhamnolipids causes the drop to expand more and collapse faster. This verifies that presence of rhamnolipids can be indicated from drop collapse tests. The drop from sample BBa_K1688000 in BL21 from table 3 collapsed after 30 seconds and expansion of drop diameter was 120% within 5 minutes from 1 cm to 2.2 cm which indicate presence of biosurfactant. The drop from sample BBa_K1688000 in DH5α collapsed and diameter expansion of drop was 90% after 20 minutes. This indicates some presence of biosurfactants. As expected the test indicate that BBa_K1688000 has higher expression rates and rhamnolipid production was higher in BL21DE3 than in DH5α as BL21DE3 is good for protein expression. The negative controls, LB medium and untransformed BL21DE3 and DH5α showed very little or no expansion, which is expected as they do not produce biosurfactants. Figure 8: in E.coli BL21DE3 cells with BBa_K1688000 on CTAB plate. 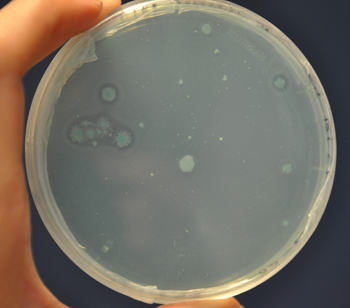 The appearance of haloes around the colonies on CTAB plates, figure 8 indicates the expression of rhamnolipids. 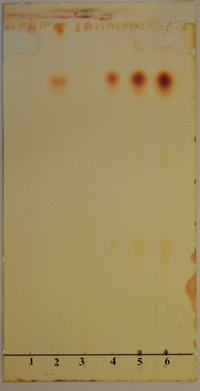 Figure 9: TLC silica plates stained with a orcinol-sulphuric acid solution. From lane 1 to 6: BL21DE3 untransformed, BBa_K1688000 in BL21DE3, P.Putida and standard mono-rhamnolipids 10, 30 and 50 μg. Table 4: Retention factor (Rf) of different samples run on TLC silica plate. 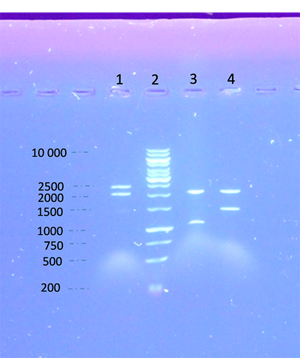 Clear spots were detected in lane 2, 4, 5 and 6 in figure 9 corresponding to the sample extracted from BL21DE3 cells with biobrick BBa_K1688000 and standard mono-rhamnolipid 10, 30 respectively 50 μg. The detection spot of BBa_K1688000 had a retention factor 0,82, the same or similar retention factor as the detection spots for standard mono-rhamnolipids (table 4), which confirms mono-rhamnolipid synthesis by BBa_K1688000 in BL21DE3 cells. Negative control; BL21DE3 untransformed in lane 1 (figure 9) showed no spot which is expected as BL21DE3 do not produce biosurfactants naturally. P. putida as a positive control showed no spot. This might be because of too low concentration of rhamnolipids in sample, problems with extraction of rhamnolipids or sample contamination. Low concentration of rhamnolipids in the supernatant might be because of used medium and growth conditions. Figure 10: The MRM chromatogram of the lipid extraction of E.coli BL21DE3 with RhlA and RhlB gene (BBa_K1688000). 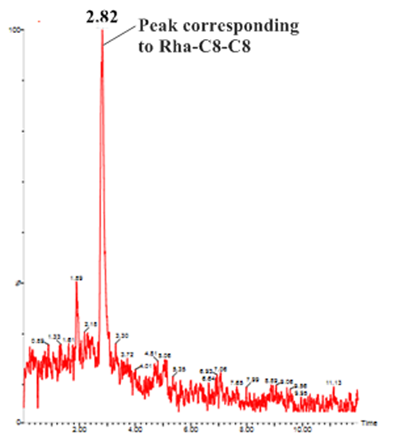 The m/z 447 ion chromatogram corresponding to (M-H)- of Rha-C8-C8 (mono-rhamnolipid) with retention time at 2.82. Figure 11: The MRM chromatogram of the lipid extraction of E.coli BL21DE3 with RhlA and RhlB gene (BBa_K1688000). 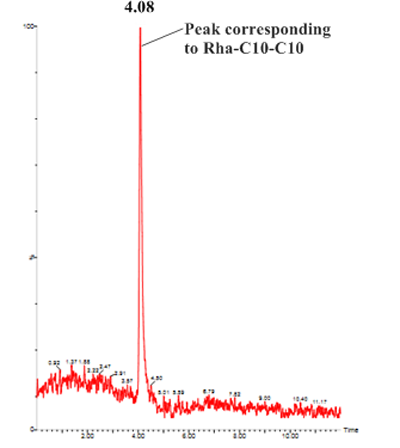 The m/z 503 ion chromatogram corresponding to (M-H)- of Rha-C10-C10 (mono-rhamnolipid) with retention time at 4.08. 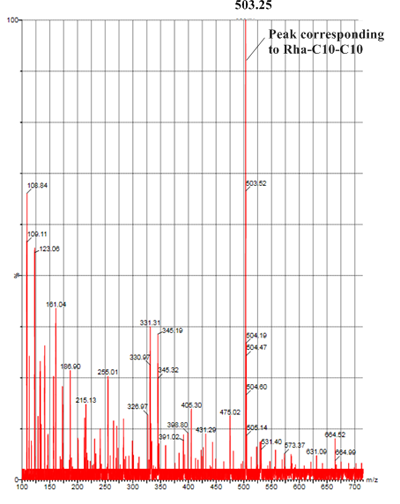 Figure 12: The mass spectrum from total ion chromatogram (TIC) of lipid extraction of E.coli BL21DE3 with RhlA and RhlB gene (BBa_K1688000). Figure 10-12 shows result for mass spectrometry of lipid extraction of E.coli BL21DE3 expressing biobrick BBa_K1688000. Figure 10 indicates presence of mono-rhamnolipid type Rha-C8-C8 in the sample. Figure 11 and 12 indicates presence of mono-rhamnolipid type Rha-C10-C10 in the sample. Laabei M, Jamieson W.D, Lewis S.E, Diggle S.P, Jenkins T.A. A new assay for rhamnolipid detection—important virulence factors of Pseudomonas aeruginosa. 2014. Applied Microbiology and Biotechnology 98: 7199–7209. Siegmund I, Wagner, F. New method for detecting rhamnolipids excreted by pseudomonas species during growth on mineral agar. 1991 Biotechnology Techniques 5(4): 265-268. Walter V, Syldatk C, Hausmann R. Biosurfactants:Screening Concepts for the Isolation of Biosurfactant Producing Microorganisms. 2010. Advances in Experimental Medicine and Biology. 672:1-13.